the hat and the computer are such contrasting elements yet the man’s attitude bring those two together to the point of adding value to the accesories. The older man reminds me of my father: an academic. Like how the shoes complement the suit. Plus, he has such a kind face. I really admire your photos, it’s like nothing that have been done here in Sweden, not with the very sophisticated image you’ve got. Though I see a lot of well-dressed people on the streets of Stockholm, they’re always looking better through your camera. I’m not gonna ask you to come over to us, it’s so beyond. But you should really know that we’re very into this, and I’m sure you remember the article about you in the latest Rodeo! 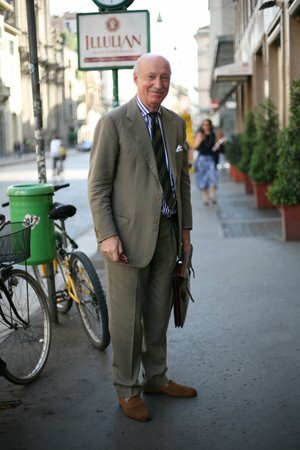 The older man looks too schlumpy to make it to the Sartorialist pages. Hope to meet you and your camera someday! What time did you take these pictures at?! Via Manzoni is never that quiet! i’ve said it before and i will say it again, why don’t more men wear hats? and none of that baseball cap nonsense…i mean the proper stuff. Fedoras, panamas, trilbys, and so forth. I enjoy your photos. I live in NYC so am most interested when your photos are of Italy or Paris. Curious what camera gear you use…? is that a “panama hat” style ?? I love the panama! The dip over his eye adds a little bit of intrigue to an otherwise normal outfit. 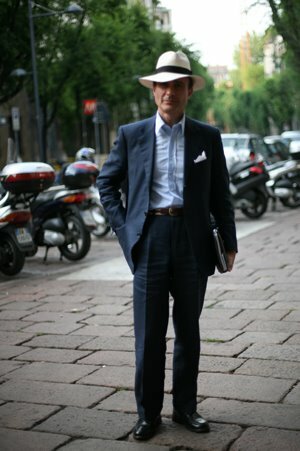 I like my fedoras to ahve that sort of brim, too. I love how he wears that hat. You have to be very cool and confident to pull it off perfectly like he has. LOVE the hat in the first picture. why cant australian guys look so slick and stylish!? everyone over here looks so crumpled and laid back! To expand on whatwouldjanicedickensondo’s comment re. hats — as a short thirtysomething man I am concerned about a hat wearing me — any tips as I am currently attending to a sunburn on my emerging scalp?